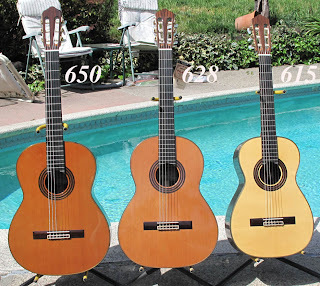 We often get questions about our shorter scale guitars, so here's a photo of 3 New World PLAYER model Guitars: 650, 628 and 615. The 2 on the left are Western red cedar and the one on the right is European spruce. You can get a sense the shorter scale guitars have smaller and different shaped bodies. 650 and 628 have 52mm [2 inch] fingerboards at the nut, the 615 has a slightly narrower 48mm [ 1 7/8"] fingerboard at the nut. While the shorter string length means easier multifret stretches, the shorter string length also means less string tension, so the strings are easier to press. These ergonomic benefits do not mean you have to compromise on quality. While smaller guitars may suit students and young people, these are not guitars for children. These guitars have a full, robust, satisfying sound, and are a complete joy to play. All the PLAYER models are solid woods, Indian rosewood back and sides, ebony fingerboard, Spanish cedar necks. They all feature an adjustable truss rod, and easy to care for high gloss finish. The shorter string length guitars offer smaller players and those with restricted reach access to a truly high quality, excellent sounding and comfortable instrument.